Edgewood’s third annual Corporate Breakfast raised $107,000 through sponsorships and contributions from corporations and individuals in support of the 11,000 children and families that we serve each year. The Greek definition of philanthropy is ‘love of humanity’. 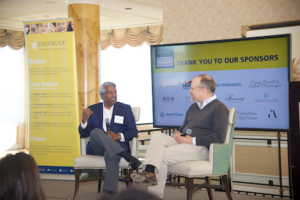 Our guest speaker Thomas Kurian spoke to philanthropy when he shared his story of his mother feeding hungry children in the town in which he grew up. 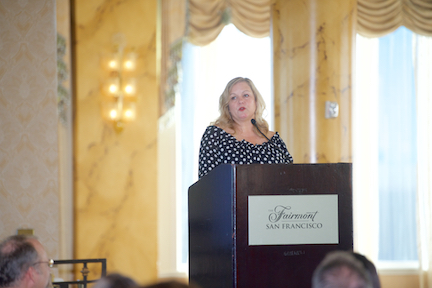 Jena Corda, the mother of a former client explained that “Edgewood has been nothing short of a miracle.” She shared the moving story of the enormous struggles their family faced when their daughter’s challenges required them to suddenly navigate the mental health care system. It was not until they discovered Edgewood that their daughter received the care she needed and was able to return home, and the whole family was able to heal. Corporate partners make a big difference in the lives of our youth throughout the year, and we look forward to their partnership in our 2019 Corporate Breakfast. To learn more, contact us directly at 415-682-3149 or at kerik@edgewood.org.